Ah the NFC North: Home to the reigning Super Bowl Champion Green Bay Packers, the very strong Bears, the resurgent Lions, and the terrible Vikings… At least in 2010. How will things turn out for this division in 2011? Let’s find out, shall we? No surprises here. When you win the Super Bowl, you’re probably going to be favored the next year too, unless something drastic happens. 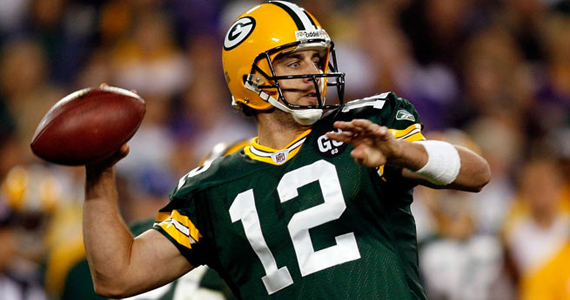 Almost the entire core of the Packers is back looking to repeat in 2011. Most importantly, Aaron Rodgers is back. He gives the team an advantage out of the gate, with his 3,922 yards, 28 TDs and even chipping in with 356 rushing yards last year. He also has a lot of weapons at his disposal to throw the ball to. 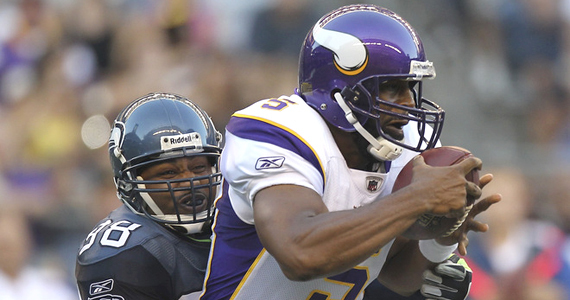 Greg Jennings had 1,265 yards and 12 TDs in 2010 as the primary weapon in Rodgers’ arsenal. Backing Jennings up are James Jones and Donald Driver, who both caught over 500 yards worth of passes last year. Tight End Jermichael Finley was on his way to doing the same when an knee injury took him out in week five, but he’s back now too. Did I mention Ryan Grant is back? The Packers won the Super Bowl without their best running back last year, because Grant was lost after week one with an ankle injury. He’s healthy and ready to run all over the NFL like he did in 2009. I have no doubt he’ll be able to do so. Defensively, the Packers finished 3rd in the Yahoo Rankings last season (2nd overall in fantasy points). They were second overall in INTs, 2nd in sacks and scored four TDs. Again, the core members of this defense have returned, so there’s no reason to believe they won’t do it again. My Prediction: 11 wins, and they’ll go deep into the post season. Fantasy Sleepers: James Starks and James Jones… If Grant and Driver get hurt again, those guys should step in nicely. Fantasy Poison: Don’t take any of their backups, be weary of injuries, but there’s no real fantasy weakness on this team. Megatron is back… and he wants to take over the NFC North. Say whaaaaaaaaaat? That’s right, Jobu is stepping out on a limb here, and picking the Detroit Lions to finish second in the NFC North. Last year, the Lions came into their own a little bit and finished at 6-10 despite injuries to their young gun-slinging QB Matt Stafford. Fortunately for them Shaun Hill filled in nicely, but not having Stafford probably cost them a couple of wins. That being said, if Stafford can stay on the field this season, the Lions will definitely improve on their 2010 season. Stafford has some nice receivers to throw the ball too, including Calvin Johnson. 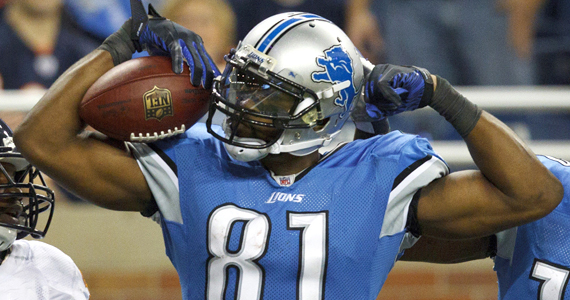 Known as Megatron, Johnson might be the most talented wide receiver in the NFL. Add Nate Burleson, rookie Titus Young (currently battling hammy issues), and tight end Brandon Pettigrew, and Stafford should be able to spread the ball around a little, if his offensive line can hold off defenses long enough for him to throw the ball. That weak offensive line will hurt their running game as well, but Jahvid Best and Maurice Morris are fast enough to get to the outside, which should help. The presence of Ndamukong Suh adds instant credibility to their defense, which was actually pretty solid last year. They had 44 sacks and caused 29 turnovers, finishing as the 12th ranked fantasy defense according to Yahoo. My Prediction: 9 wins… if Stafford can stay on the field. 6 wins if he cannot. Fantasy Sleeper: Defense… if they keep improving, they could be a top ten defense this year. Can Forte carry the Bears back to the top of the division? The Bears haven’t had back to back winning seasons since 2005 and 2006. They just seem to have trouble really building on the successful seasons they put up. That, and the emergence of Matt Stafford and the Lions, could spell doom for the Bears in 2011. Success starts with the QB position, and the Bears have a good one. Love him or hate him, Jay Cutler is capable of leading this team to victory. If he can cut down on his interceptions, this team will do great in 2011. That being said, I don’t think he will. He’s a bit of a baby, and it holds him back. Cutler is also held back by the lack of a real number one receiver. To help him, the Bears picked up Roy Williams this off season… That’s not gonna cut it. He’s better off throwing to speedsters Johnny Knox and Devin Hester. At running back, Matt Forte had a very good year in 2010. He ran for over 1,000 yards and had 547 yards receiving, and his nine TDs led the team. Chicago has always been known as a defensive team, and they finished 4th overall in the Yahoo rankings last season. They could use some more sacks, but they did cause 35 turnovers last season, which will rack up the fantasy points. My Prediction: 9 wins… not as big a let down as they’ve had before. Fantasy Sleepers: Johnny Knox. Knox figures to lose some targets to Roy Williams, but that won’t last. Knox is too fast to not be utilized. Fantasy Poison: Roy Williams. I just don’t get why the Bears bothered. He’ll have some good games, but they will be few and far between. The Vikings have finally gotten out from under the old and decrepit body of Brett Favre. They don’t have to worry about his old bones collapsing on the field, or his aging arm throwing interceptions and blowing games for them. That’s right, they’ve found a youthful and vibrant replacement… Donovan McNabb… sigh. McNabb won’t be as bad as Favre was last year, but he’ll be 35 before the season ends. How much can they really expect from him? If he stays healthy, he might put up 3500 yards. Either way, he’s a stopgap for rookie Christian Ponder. McNabb needs to find someone to throw the ball to. Sidney Rice left for Seattle money. This leaves Percy Harvin and his migranes (my mom gets those too) and thirty-year-old Bernard Berrian. At least tight end Visanthe Shiancoe is back to catch touch downs. I don’t need to tell you that Adrian Peterson is one of the best running backs in the league and will probably win three games on his own this year. Finally, there’s the defense, which finished 26th overall in the Yahoo rankings last season… and it hasn’t gotten any better… ouch. Fantasy Sleepers: Donovan McNabb… odd to see him as a sleeper, but we all saw what Favre did his first season in Minnesota, so why not? Fantasy Poison: Bernard Berrian… He’s not that good, he never has been, and now he’s 30. Also, the defense blows.